Our Standard Retractable Banner Stand is a huge seller; all of our customers love the attention that it brings to their business. However, today, we will be drawing your attention to the Premium Banner stand. We took something good, and made it even better! Our Premium Banner Stand will increase your businesses appearance! The glossy ends are finished with a high end chromed look + a brushed aluminum metal surface to create the most elegant stand on the market, The deluxe heavy duty construction of the support poles provides a stable environment for your personalized banner. Each Premium Banner Stand order comes complete with a padded nylon carry bag for easy storage and transportation. 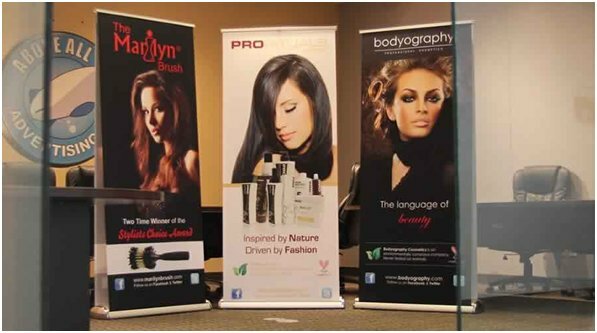 When you are ready to use the Premium Retractable banner stand, gently pull the fabric up from the base stand mechanism and then secure it to rear support pole which will hold up graphic banner taut in place for advertising and usage so that you can display your beautifully printed retractable banner with pride. This high quality stand is the perfect upgrade for any regular standard stand! Contact your local sales representative to get pricing on this amazing deal.